Try my new Quick Games for the web. No installation required. Play on any device. Challenge your computer to a one-on-one game of Cribbage. Designed to help you practice and refine your Cribbage skills when a partner isn't available. Teaches you how to count by displaying the points during play and at the end of each hand. Keeps score for you on a life-like crib board display. Places the crib-board on the tabletop rather than in a pop-up window and includes all the latest and greatest features. Bigger and better card images on higher resolution displays. Removed the play-bar from the bottom of the Window and replaced the functionality with menu choices and hot-keys freeing up more of the screen real-estate for the cards. Also added a larger Crib Board. Simplified the layout of the cards in the play piles and when counting the hands. Other improvements in this release include a Hint button to assist you when choosing your discards and the ability to use any Windows image (files with a .bmp extension) as a background. Smoothed out the card graphics by upgrading the images to take advantage of modern displays. Previous releases used only the standard 16 colors. The first version built for the modern 32-bit versions of Windows (95, 98, NT, 2000, etc.). The final version for Windows 3.x (often referred to as 16-bit Windows). If you have an old Windows machine lying around and you want to put it to use this is the version you want. 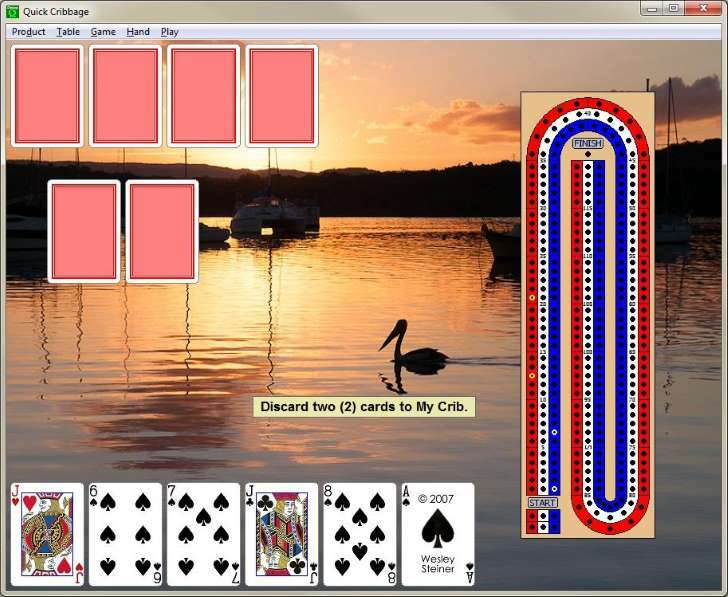 Click this link to download Quick Cribbage to your Windows PC. Quick Cribbage is now available to play on the web. No installation required and no setup. Works on all platforms including tablets and smartphones. Don't have a Windows PC? Try my new web based games. They work on all modern devices and platforms. No installation required and no setup. It's 100% secure and I won't ask for any personal information. Have a suggestion or idea? Send me a quick note.